Space: if shamans journey out of the spaces of the living to interact with the spirits and the dead while masks are the dead/spirits/initiates who travel from the Otherworld into the spaces of sociality, what does this imply for the cognitive and epistemological foundations of either practice? Place: what are the respective places of initiation for shamans and the neophytes of secret societies of masks? How does the general notion of the aspiring shaman spending time â€˜with the spiritsâ€™ compare (and contrast) with the seclusion of initiates in the bush or other similar â€˜otherplacesâ€™? How to differences in training relate to wider differences in the prerogatives of masked societies and shamans? Power: both shamans and masked societies patrol the outer boundaries of sociality, often with policing powers, to counter evil in all its forms. How does the collective dimension of the shamanâ€™s engagement with crime and other forms of social distress compare to the masksâ€™ prerogatives in the same field? Do the two functions somewhat overlap and complement one another? History: Do shamanism and secret societies of masks constitute steps in the developmental process of the means to interact with the â€˜otherworldâ€™ and, if so, what are their interfaces? Can they ultimately be understood as subsequent â€“ if occasionally cumulative â€“ steps in the passage from hunting and gathering social formations in the Paleolithic to the agrarian civilizations of the Neolithic? The paper will follow up the argument already expounded by this author in the ISARS conference in Warsaw, 2011, under the heading Â«Shamanism in the NeolithicÂ», and it will attempt at bringing it a few steps forward, on to the specific social contexts of the mature chiefdoms and/or the pristine states of the Western Mediterranean (early Rome and Sardinia) around the Bronze/Iron age transition. Within this horizon, a number of possible archaeological and/or textual testimonies, some of which original, will be discussed. These, may provide a consistent body of evidence as to the metamorphoses of shamanic practices in the context of the emerging religious fraternities and the societal cults of that age. Bearing faith to some encompassing evolutionistic paradigm of the anthropological enquiry, the paper will draw some suggestions out of a maverick figure of contemporary cognitive psychology, or be it conjectural anthropology, that is out of Julian Jaynesâ€™ insights as to the emergence of modern human consciousness, as being directly relevant to the explanation of the sudden appearance in prehistory of that foremost tool of the shamanic art, which is the mask. The debate about the cultural specificity of shamanism as a distinctively â€˜Asianâ€™ (and American) trait, as against, for instance, â€˜possessionâ€™ and â€˜tranceâ€™ as peculiarly â€˜Africanâ€™, has characterized the (admittedly marginal and marginalized in the current climate) debate on the â€˜grand narrativesâ€™ of anthropology for a number of decades. As such it has somewhat become an unresolved case in the disciplinary archives. Beginning with the much-debated question â€˜where does this leave Europe?â€™, this contribution will make and attempt at tracing a map of the distribution of the phenomenology connected with shamanism, masks and spirit cult within which masks, trance/possession and the shamanic experience represent complementary aspects of the relationship between humans and â€˜spiritsâ€™. 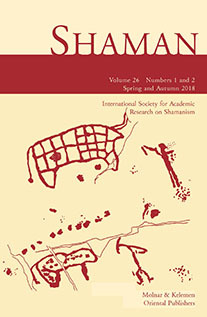 It will be in particular argued that the cultural complex known as â€˜shamanismâ€™ is more likely to emerge in contexts linked to early forms of pastoralism and to the centrality of hunting ideologies, while masks, as organized in secret societies, are rather to be found in cultural systems based upon agriculture as a collective, age-based enterprise. The European case of the Benandanti on the one hand, and the West African case of the Ejo â€˜shamansâ€™ of the Gurunsi-speaking populations of Northern Ghana, will provide ethnographic evidence for the simultaneous presence of both â€˜hybridâ€™ forms of â€˜shamanismâ€™ and collective ritual associations â€“ namely secret societies of masks – within cultural formations where hunting, agriculture and sedentary pastoralism provide the basis for the dominant ideology. A curious and interesting ritual motif can be studied transversally in European contexts and in a lapse of time that roughly goes from antiquity to modern times: the performances of men disguised â€“ and acting â€“ as animals. These rites or pseudo-rites, undertaken especially in certain environments and at certain times of the year, were considered â€œpaganâ€ or â€œvulgarâ€ or â€œpopularâ€ according to the specific age taken into consideration. In fact, they were usually not accepted or tolerated by representatives of â€œhigh cultureâ€, and especially not by the clergy. In this paper I will present an overview over the rather diverse interpretations of these phenomena that have been proposed in the scholarly literature in the last few decades. I will focus, more particularly, on the historical-anthropological interpretations addressing sources from Late Antiquity, the Middle Ages, and the Early Modern times (with occasional references to contemporary folklore as well). I will then review the most significant studies dealing with possible connections of these performances and rituals with initiatory rites or with a hypothetical Eurasian â€œshamanic substratumâ€ which would constitute the cultural matrix of these manifestations, as proposed in a well-known book by a Italian historian. In so doing, I will also propose my own conclusions about these and related topics, conclusions which have recently been published in several pieces of writing.